Ave, Caesar! Or at least that’s what the plebians will shout when they see you stroll into the forum wearing this authentic Roman Centurion’s gear. 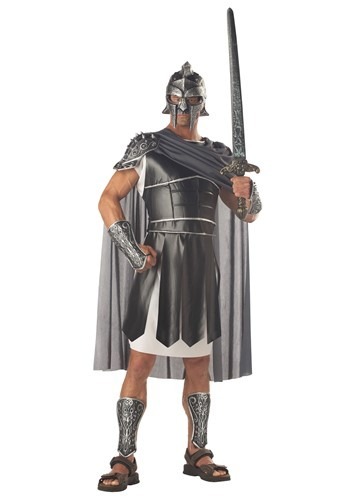 The steely breastplate, intimidating helmet, and manly leather skirt will prove to those peasants that you, a soldier of Rome, stand to protect and guide civilization. Wearing this costume, you will undoubtedly find yourself dispensing bread and circuses to the masses before you know it. From the Circus Maximus all the way down to the Coliseum, the citizens of mother Rome will line the streets for your triumphant walk down to the curia to accept your honorable reception and nomination as Imperator in perpetuo! And only the best armor would befit you, Caesar! We here at Fun.com have harnessed all the best of modern technology to create an advanced suit of armor in the traditional style of a Roman Centurion. The fabric and faux leather, while admittedly less protective than the more commonly used steel, has great advantages in flexibility, and the weight reduction reduces fatigue by at least 90%. The standard tunic underneath is both useful and stylish, and is a great choice for any event, with or without the armor. Even better, you never have to worry about the cape detaching and unceremoniously fluttering to the ground since we have discovered a way to attach it to the breastplate itself. In any case, and at any event, you will find this Adult Centurion Costume both fashionable and fun to wear. Hail, Caesar!